Premium subscriptions give access to AFS Analytics’ advanced features and technical support. The benefits of the different plans are listed on the pricing page. Note: You can upgrade to a premium plan at any time. We accept credit card or Paypal as payment method. Once subscribed, you will receive a subscription code, this code allows you to assign your subscription to one or more websites. 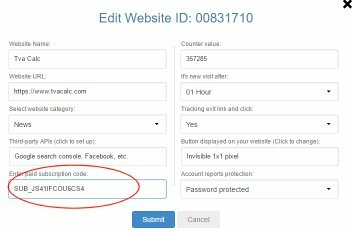 To assign a subscription to one of your sites, you must type the code in the Enter a subscription code field on the website settings form. 1. Left Menu -> Account -> Manage websites. 2. Press the edit button on the box dedicated to the website. Note: A subscription code can be used on multiple sites depending on the quantity selected when ordering. If you want to disable the subscription code attached to a site, replace the subscription code with NULL in the subscription code field on the Edit website info form. The subscription code may be used on another site. Access to subscription management is done via the main menu Account by selecting the subscription(s) options. Subscriptions related to your account will be displayed. The Update billing info button allows you to change the billing address and to indicate the VAT number for companies located in the European Union. The Update credit card button allows you to update your credit card information. Note: If you selected Paypal as your payment method, you must update your card information on PayPal. The trash icon allows you to cancel the subscription. Once the subscription is canceled, charges from your credit card will be stopped. Warning: by canceling a subscription you risk losing the statistics of the websites linked to the subscription. 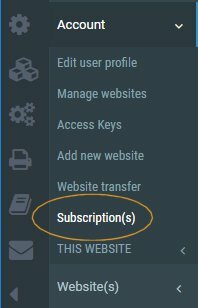 To change your current subscription plan, we recommend that you initiate a new subscription, change the old code attached to the site to the new one, and then cancel the old subscription. By doing so, you are sure to keep the statistics attached to your website.